The HP Mini 5103 is a compact notebook specially designed for business users has stylish and solid design with high-end configurations, easy-to-use keyboard, HD screen and runs on dual-core Intel Atom N550 processor. But the battery life is very poor and has very small track pad. Also, the net book is very expensive because of its high-end configuration. There are some useful business features including 10-inch HD screen making it ultra portable and comfortable to carry for people who travel frequently. With starting price of 399 dollars, this compact net book from HP comes with broadcam HD accelerator and capacitive touch screen feature which will increase the price to 670 dollars. It runs on 1Ghz Intel Atom Dual core processor, 2GB DDR2 Ram, 160 GB hard disk, NM10 chipset and Intel GMA 3150 integrated graphics. The netbook runs with Windows 7 professional operating system and has dimensions of 10.3×7.1inches. The screen size measures 10.1 inches diagonally and the netbook weighs 3.5 pounds diagonally. 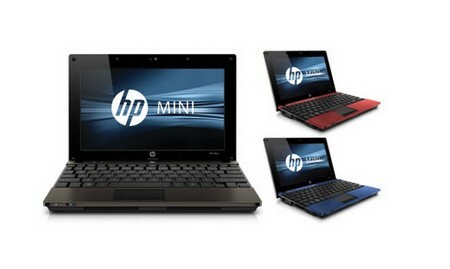 The Mini 5103 netbooks has a premium design and sleek appearance. It has brushed solid back lid with a smooth opening hinge. The textured plastic inside is very soft and there is a comfortable keyboard and narrow palm rest. The inside of netbook has Espresso finish which appears like rich metallic brown. There is a power button at the center which glows in light blue. There are two buttons on its side for e-mail and web access. The LED backlit screen has native resolution of 1024×600 pixels and you can high definition screen for additional 25 dollars with native resolution of 1366×768 pixels. The stereo speaks in front has very good sound quality and suitable for video chat and watching videos. The netbook also includes a 2 megapixel web cam that supports maximum resolution of 1600×1200 pixels which is good for video chatting. There are three USB 2.0 ports and SD card reader in the side. There is support for Wi-Fi, Ethernet and Bluetooth. One minor drawback is lack of HDMI output port. The screen is very good for watching high definition videos and casual gaming. The 4-cell lithium ion battery lasts only for 2 hours 42 minutes which is not sufficient enough for travelers. The net book comes along with 1 year warranty and you can get 24/7 customer support. The drivers can be downloaded from HP’s website. Overall, this highly priced netbook with high-end configuration is good choice for business users.